Google local and map have become a big influence on how people search. Businesses will now have to have a visible and physical location if they want to be listed in a local search, in the past businesses could hide their physical location and yet still be found locally through their websites. Being at the top of a Google search is every businessman's dream and until recently, firms that once held the top position, have found their listings dropping off of the prime positions, this came about when Google introduced changes to how local business would be listed in a search result. See the article Google Place Search changes how searches are displayed for more detailed information that we reported last November. What this now means is that, it has become more difficult for businesses to rank at the top of a local search unless they have realised that they now have to spend much more time and effort on local search engine optimization. Businesses that had previously enjoyed a prominent position on the old Google Map without a website, which was possible before, will now find it almost impossible to maintain a listing without a well developed and locally optimised website. "Businesses will now have to have a visible and physical location if they want to be listed in a local search, in the past businesses could hide their physical location and yet still be found locally through their websites, but now consumers searching for a business in a location will be able to determine if they contact that business or not based on their location" says Peter Bowen, SEO expert at First One On, "as Google exposes competitors in searches it is now revealing where those businesses are located – hopefully providing the consumer with more relevant localised information before making a purchase decision in the long run". The most important aspect of optimising for local search engine optimization is that the website now needs to have a separate, optimised page for every location where the firm conducts business. Ensuring that these pages are optimised for both the main keywords as well as for localised keywords now becomes paramount. 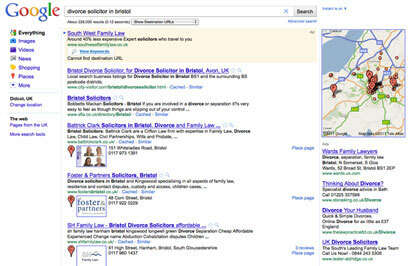 For example, the title of the website page might be "divorce solicitor in bristol". Each of the optimised local pages will match a different optimised Google Places page. Each specific business location has to have its own page listed in Google Places that has been both verified and optimised. You should spend time ensuring that all the sections are filled out as fully as possible and are well optimised. Place Name: Do not attempt to include all of your keywords in the name as you would do in the website page title. Google sees these types of names as spammy, and will filter the results to exclude these listings. This section should include the name of the business and the location. Only include keywords when they make absolute sense in the name. Contact information: Should be exactly the same as how it appears on the corresponding page on your website. This increases the credibility of both the website and the places page.